The “hedge” on the southern boundary had grown quite tall and – unlike the other hedges – hadn’t been regularly trimmed by the neighbouring farmers. Really it was more of a line of bushes and trees than a proper hedge. 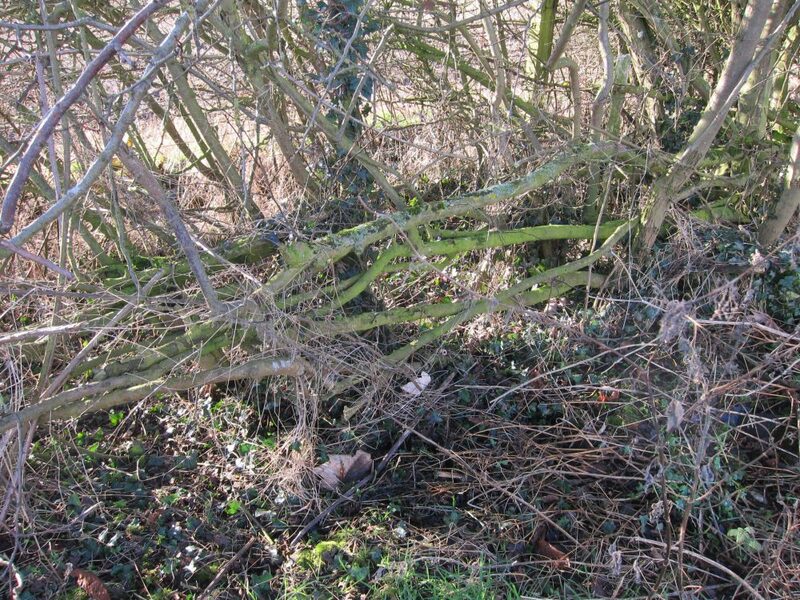 In some areas there was evidence of hedgelaying having been done a long time ago – especially some near-horizontal stems in amongst the vertical growth. The southern boundary is about 15m from the house and the open-plan family room faces directly on to it via some large sliding glass doors, so it’s quite a visible feature and needs to look respectable. The plan has always been to bring the hedge back under control by hedgelaying it in the Derbyshire style. This is tricky to do well so I was keen to bring in someone who knew what they were doing. 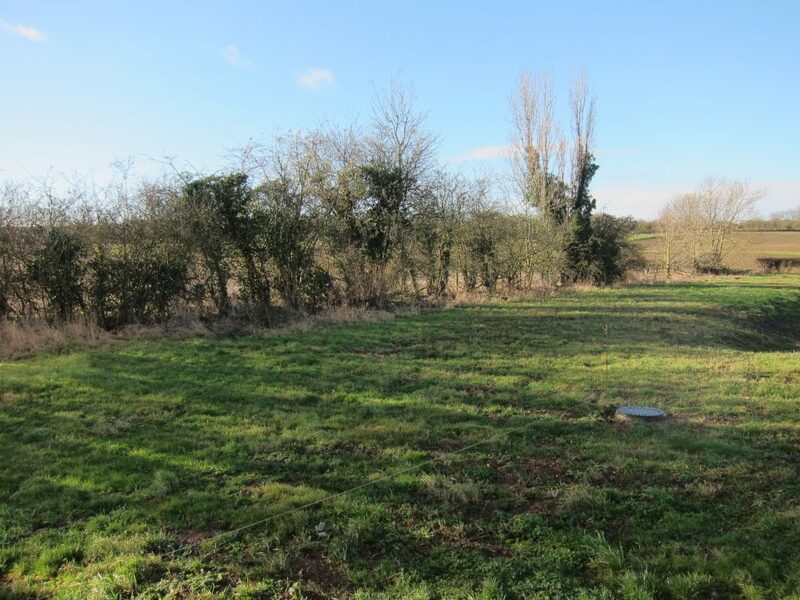 Any Internet search quickly turns up the National Hedgelaying Society so I used their “Find a Hedgelayer” query tool to find local contractors and settled on having award-winning local hedgelayer Derrick Hale undertake the work. 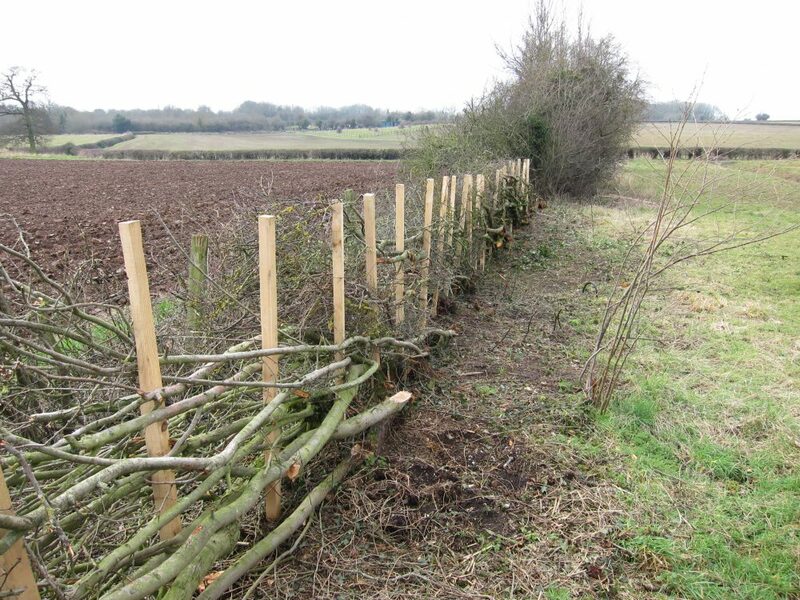 Hedgelaying is a winter job – while there are no birds nesting and while the hedge plants are dormant – so there are limits on when it can be done and it’s prone to being delayed by bad weather. The job is now roughly 2/3 complete which provides a nice opportunity for a “before and after” comparison. The hedge was in very bad condition beforehand which means it doesn’t look as tidy as it might have done afterwards but I’m very happy with the results so far. There are plenty of gaps which will need filling with new hawthorn plants but once those get chance to grow a bit it will look a lot better. Hedgelaying the Southern Boundary by Marsh Flatts Farm Self Build Diary is licensed under a Creative Commons Attribution-ShareAlike 4.0 International License. This entry was posted in Landscaping by dMb. Bookmark the permalink.